Learn about some of the species, all magical in their own way, below. Don’t worry – it’s spoiler-free. In Game of Thrones, direwolves resemble typical wolves – except for the fact that they’re much larger and are kept as pets by the Stark children. 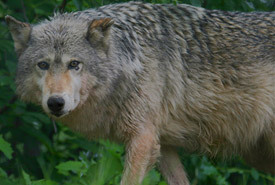 For years, the eastern wolf was thought to be a sub-species of the grey wolf. 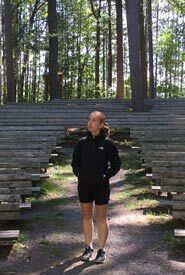 However, genetic testing shows that Ontario is home to two distinct wolf species: the grey wolf and eastern wolf. Interestingly, the eastern wolf is more closely related to the endangered red wolf of North Carolina than to its Canadian cousin. While we don’t recommend keeping a wolf as a pet, you can honour the Stark house by symbolically adopting an eastern wolf through the Nature Conservancy of Canada’s (NCC’s) Gifts of Canadian Nature program. Canada lynx is one of this country’s most elusive predators. In Game of Thrones, the shadowcat, thought to be a cross between a tiger, mountain lion and lynx, is similar to the Canada lynx in more ways than just looks. 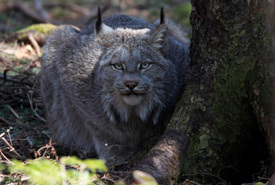 While Canada lynx are found throughout the large, intact boreal forests of Canada, shadowcats are only found in mountains north of the Wall, as well as in the Vale. Because both species prefer northern habitats, the Canada lynx has large paws covered in thick, coarse hair that allow it to stay on top of deep snow. Like the shadowcats in Game of Thrones, Canada lynx are seldom seen in the wild, stealthily hunting prey. Easily one of the scariest characters in Game of Thrones, the White Walkers are zombie-like ice humans created by the Children of the Forest from the northern depths of Westeros. The White Walkers of the forest, the ghost pipe is a perennial wildflower that gets its name from its shape and pure, pale-white colour. 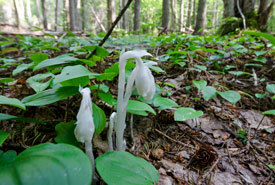 Similar to the frozen undead, the ghost pipe lacks pigment, due to the fact it does not produce chlorophyll. While the Night King, leader of the White Walkers, uses his powers to turn humans into members of this army, this plant uses its powerful, large network of roots and associated fungi to “steal” energy from surrounding plants. Unlike the White Walkers we see on the screen, the ghost pipe has been documented on over 100 NCC properties across Canada, including in central Cape Breton, the Manitoulin Island Archipelago and the Salish Sea. While you tune into the final season of Game of Thrones, remember that not all good things have to come to an end. NCC is working to protect habitat for these magical species and many more across Canada. From the icy tops of Darkwoods, BC, resembling the snow-covered peaks of the Mountains of the Moon, to the coastal shores of the Musquash Estuary in New Brunswick, mimicking those of the Iron Islands, NCC is working to protect land now and for many seasons to come.